New York, April 28, 2015 | Trouble Viewing as Email? Recently I finished a book by Amanda Palmer called The Art of Asking: How I Learned to Stop Worrying and Let People Help. I learned a lot from Amanda's book, which I plan to review with the June monthly horoscope in a few weeks. Right now I want to put some of what I learned to work: Planet Waves needs your help. The Art of Asking, released in late 2014 by Amanda Palmer: living statue, rocker and writer, formerly of the Dresden Dolls. After making many improvements to our business, we're experiencing a sudden drop-off in sales that is jeopardizing my ability to keep things going. Before the situation runs beyond the point of no return, I thought it would be better to let you know what's up. 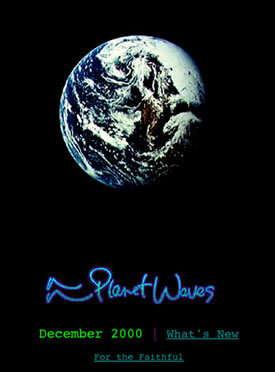 For months now, I've been personally supporting Planet Waves. I've stopped taking commissions for projects such as the annual edition. I've been donating my outside writing fees, consulting fees and teaching fees to the company, in essence working outside jobs to make payroll and support all of our work at Planet Waves. Obviously this is neither healthy nor sustainable. Toward the end of this letter I have some options for how you can assist, if you are willing, to the best of your ability. I do, however, need help keeping the Planet Waves vision, built day by day over the past 20 years, alive. My business plans go well past survival, but first things first. Here is a bit of backstory. Over the past year, Planet Waves has completed a total infrastructure overhaul, replacing programming that predated the existence of YouTube. We've created something that's beautiful, easy to use and that brings all of our content into one place. Another overhaul has been to our accounting and bookkeeping. Between last autumn and today, we have built a new business management structure, headed by a professional accounting team. This took countless hours of meticulous work, training and reorganizing -- thankfully that is done. And in a third somewhat less dramatic improvement, I've built a custom website and studio for Planet Waves FM -- Internet radio being one of my dreams for Planet Waves since the very early days. Planet Waves FM is now available to our community as a platform to host any other podcasts. Through this process, I've done my best to improve the quality of our content, and recruit talented astrologers, writers, artists, cartoonists and other creative contributors. The result is a carefully edited, fact-checked, proofread, intelligent, in-depth website like nothing else you can find on the Internet. What astrology website has a professional fact-checking team? In all, a beautiful thing. The website upgrade did not help business. In some ways it seems to have hurt. We are not getting subscription sign-ups off of the front page. Many of our older subscribers were not interested in change, and have chosen not to upgrade; some have dropped off. Declining subscription rates (called conversions) have been a problem for a while, though I was pretty sure that a new website would help stabilize that. Despite working with a series of marketing consultants and thinking the questions through backwards and forwards, and reworking the sales presentations many times, readers are not subscribing from the web -- and we don't know how to address this. After opening the new site, traffic and our ranking fell by half. This is difficult, given that we were not all that visible to begin with. If you happen to be a magazine editor, or radio or TV producer, you might be able to help with that. Over the past seven years, I've grown Planet Waves (every year through the recession and beyond) on my prepared audio readings -- birthday readings, spring and midyear reports, the annual edition and special projects. Now sales of those items has fallen off. 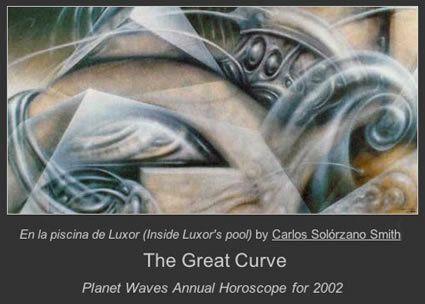 Planet Waves has always lived on a thin margin. We get by on a modest budget, and I consistently reinvest any potential profits into the company. Many volunteers help out, in addition to employees and contractors. This is the second difficult month we've had this year, and sales of the 2015 annual were among the lowest in company history. Given the spectacular feedback I got on Cosmophilia, I don't think this was an issue of quality. I have gone over these issues many times, with many people. There is no easy explanation. During the 19 years I've been creating websites, the ocean of the Internet has become dominated by massive money interests and ever-larger websites that create serious competition for traffic, and now, for subscriptions. When I began, mine was one of the only astrology websites. Now there are millions, with the bigger ones paying to dominate search results. There is the seemingly epidemic viewpoint that everything online -- especially if it has a spiritual perspective -- should be free. Someone recently told me they tune in regularly but refuse to subscribe because it would be like paying to have a friend. The "smart" phone obsession has created an expectation that everything should be miniaturized, abbreviated and understandable in five seconds on the run. Planet Waves has bucked this tendency toward shallowness, providing you with solid articles on real topics. If there's a 'reason' I love my work, it's that I get to be true to my message. I get to be real with you. I get to write an in-depth horoscope, that speaks to your inner life. I recognize how rare that is in this world. For many people, we remain their only source of news -- because we're the only place that presents it on a human scale, with some context and spiritual grounding (and no ads). By all rights we should be thriving. And creatively, we are. We are all excited about our work and are productive every day. Regardless of why this other problem is happening, I've been doing what I can to sustain my business. I've been paying personally to keep Planet Waves going, with everything I've got. But I cannot sustain this on my own. I need your help. In the short run, we need cash flow. There are a few ways you can help, depending on your means. Having successfully made all these improvements (and retained full ownership of Planet Waves stock), what we really need is to re-capitalize the company, and if you want to help with that, please write to me. Thank you from Jonah and Eric. At this point anything that helps me get back from the edge will also help me focus on my work, and give me some room to think and breathe. One thing you can do is upgrade to Core Community. You have two sliding scale options -- one year and six months. You might also get someone a gift subscription. You can get Cosmophilia, my 2015 annual readings. Here is the signup for one or more signs; here is the signup for all 12 signs. You can offer your kids or a friend with young people in the house a gift of my Millennial Reading, which will be ready this week. This is an astrology reading specifically for young people trying to find their way. Finally, you have the option to make a donation to Planet Waves. Here are links for three levels of that -- $250, $500 and $1000. At the higher two of those three levels, I can offer you a personal astrology reading. At the lower, I will comp two of your friends the 2015 annual edition. 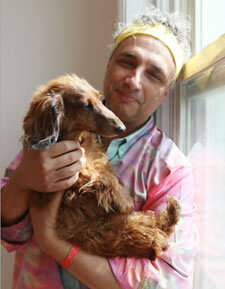 If you want contribute by mail, the address is: Planet Waves, Inc., PO Box 3606, Kingston, NY 12402. If you want to write to me, you may email me at efc@ericfrancis.com. With the exception of when I'm recording Planet Waves FM Tuesday, I will be available this week at my direct line, (845) 338-4846. This is an old-fashioned phone line complete with a busy signal (and no answer if I'm recording); if you want to leave a message or contribute by phone you may call Lauren at (845) 331-0355. Thank you for your years of support, your many kind letters, and for doing what you can do now. PS -- I am interested in meeting you. This will be easy if you live in the Northeast within driving distance. I would be happy to do a group breakfast or dinner meeting with my clients in Kingston, Ithaca, Boston, New York City or Long Island. Please let me know!